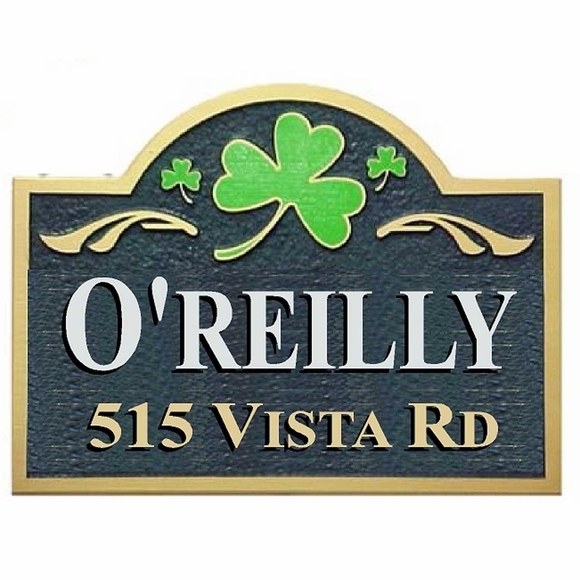 Custom Name & Address Plaque with Shamrock - - Irish theme 24" x 18" arch shape address sign features a bright green shamrock inside the arch. Wall mount. Made in USA. Personalized with your family name printed in white above your house number and street name printed in gold. Name line holds up to eight (8) large characters. Address line holds up to twelve (12) smaller characters. The background is sandblasted with a sandstone texture. Painted with two coats of primer and two coats of acrylic latex or polyurethane paint. Design elements include the gold border, gold accents, shamrock, and two-color wording. Dimensions: 24"W x 18"H x 1.5" thick.